ownerIQ’s in-house Creative Service team helps the Q’s partners and clients stand out amidst the noise and clutter of the digital landscape with truly impactful and customized digital experiences. Maximizing your ad banner rotation to achieve programmatic excellence across all devices, ownerIQ’s Optimized Creative Showcase boasts a breadth of ever-expanding capabilities, from product carousels to animated HTML units to tap-to-map units and static ads. Here’s a peek at some key benefits of creative solutions using helpful examples and visuals. This interactive, rich media unit significantly increases overall brand lift by featuring multiple product SKUs from the Thomas & Friends 2016 Holiday Gift Guide; especially important during the busy and competitive holiday shopping season. You are unable to see this ad because your browser does not support iframes. Animated HTML5 ad units create an engaging way to relay your brand messaging while simultaneously calling attention to specific products or features. By utilizing rain and text animation, we engage the user and enhance the Columbia Sportswear “Tested Tough” rain gear message. When paired with our exclusive second-party data and geo-weighting product, tap-to-map store locator units drive in-store outcomes by targeting qualified shoppers nearby relevant store locations and guiding those shoppers in-store. By employing this creative solution, Eastern Bank’s tap-to-map incentivizes users to visit their nearby Eastern Bank location to learn if they qualify for an Eastern Free Checking account and chance to receive $100. Static creative can supplement multiple campaign goals and marketing strategies, from raising awareness and amplifying brand message to driving sales of a specific product or unit category at a specific retailer. 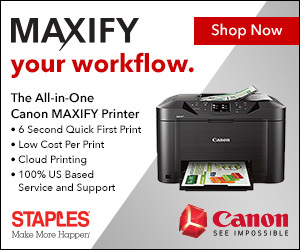 For Canon, optimized static creative to promotes product brand awareness for the new to market InkJet MAXIFY printer among Staples shoppers while driving unit lift at Staples, both online and in-store. If you’re looking for creative solutions to strengthen consumer engagement, increase brand recall, lift online and in-store sales, and more, look no further than to ownerIQ’s Creative Services. Check out ownerIQ’s creative showcase, featuring a selection of in-house developed custom creative solutions for retailers, brands and programmatic advertisers, and let’s work together to exceed your campaign goals with our custom creative offerings. Start the creative conversation today, simply email ClientCreativeServices@owneriq.com or reach out to your local sales rep.